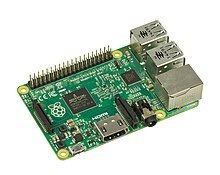 The Raspberry Pi uses a system on a chip as an almost fully contained microcomputer. This SoC does not contain any kind of data storage, which is common for a microprocessor SoC. A system on a chip or system on chip (SoC /ˌɛsˌoʊˈsiː/ es-oh-SEE or /sɒk/ sock)[nb 1] is an integrated circuit (also known as a "chip") that integrates all components of a computer or other electronic system. These components typically (but not always) include a central processing unit (CPU), memory, input/output ports and secondary storage – all on a single substrate or microchip, the size of a coin. It may contain digital, analog, mixed-signal, and often radio frequency signal processing functions, depending on the application. As they are integrated on a single substrate, SoCs consume much less power and take up much less area than multi-chip designs with equivalent functionality. Because of this, SoCs are very common in the mobile computing (such as in Smartphones) and edge computing markets. Systems on chip are commonly used in embedded systems and the Internet of Things. Systems on Chip are in contrast to the common traditional motherboard-based PC architecture, which separates components based on function and connects them through a central interfacing circuit board. [nb 2] Whereas a motherboard houses and connects detachable or replaceable components, SoCs integrate all of these components into a single integrated circuit, as if all these functions were built into the motherboard. An SoC will typically integrate a CPU, graphics and memory interfaces,[nb 3] hard-disk and USB connectivity,[nb 4] random-access and read-only memories and secondary storage on a single circuit die, whereas a motherboard would connect these modules as discrete components or expansion cards. More tightly integrated computer system designs improve performance and reduce power consumption as well as semiconductor die area needed for an equivalent design composed of discrete modules, at the cost of reduced replaceability of components. By definition, SoC designs are fully or nearly fully integrated across different component modules. For these reasons, there has been a general trend towards tighter integration of components in the computer hardware industry, in part due to the influence of SoCs and lessons learned from the mobile and embedded computing markets. Systems-on-Chip can be viewed as part of a larger trend towards embedded computing and hardware acceleration. An SoC integrates a microcontroller or microprocessor with advanced peripherals like graphics processing unit (GPU), Wi-Fi module, or one or more coprocessors. Similar to how a microcontroller integrates a microprocessor with peripheral circuits and memory, an SoC can be seen as integrating a microcontroller with even more advanced peripherals. For an overview of integrating system components, see system integration. Programmable systems-on-chip (PSoC), where most functionality is fixed but some functionality is reprogrammable in a manner analogous to a field-programmable gate array. Systems-on-chip can be applied to any computing task. However, they are typically used in mobile computing such as tablets, smartphones, smartwatches and netbooks as well as embedded systems and in applications where previously microcontrollers would be used. Where previously only microcontrollers could be used, SoCs are rising to prominence in the embedded systems market. Tighter system integration offers better reliability and mean time between failure, and SoCs offer more advanced functionality and computing power than microcontrollers. Applications include AI acceleration, embedded machine vision, data collection, telemetry, vector processing and ambient intelligence. Often embedded systems-on-chip target the internet of things, industrial internet of things and edge computing markets. S series and W series, in Apple Watches. Apple T series, used in the 2016 and 2017 MacBook Pro touch bars and fingerprint scanners. Snapdragon (list), used in many LG, Xiaomi, Google Pixel, HTC and Samsung Galaxy smartphones. In 2018, Snapdragon SoCs are being used as the backbone of laptop computers running Windows 10, marketed as "Always Connected PCs". As long ago as 1992, Acorn Computers produced the A3010, A3020 and A4000 range of personal computers with the ARM250 system-on-chip. It combined the original Acorn ARM2 processor with a memory controller (MEMC), video controller (VIDC), and I/O controller (IOC). In previous Acorn ARM-powered computers, these were four discreet chips. The ARM7500 chip was their second-generation system-on-chip, based on the ARM700, VIDC20 and IOMD controllers, and was widely licensed in embedded devices such as set-top-boxes, as well as later Acorn personal computers. Systems-on-chip are being applied to mainstream personal computers as of 2018. They are particularly applied to laptops and tablet PCs. Tablet and laptop manufacturers have learned lessons from embedded systems and smartphone markets about reduced power consumption, better performance and reliability from tighter integration of hardware and firmware modules, and LTE and other wireless network communications integrated on chip (integrated network interface controllers). An SoC consists of hardware functional units, including microprocessors that run software code, as well as a communications subsystem to connect, control, direct and interface between these functional modules. An SoC must have at least one processor core, but typically an SoC has more than one core. Processor cores can be a microcontroller, microprocessor (μP), digital signal processor (DSP) or application-specific instruction set processor (ASIP) core. ASIPs have instruction sets that are customized for an application domain and designed to be more efficient than general-purpose instructions for a specific type of workload. Multiprocessor SoCs have more than one processor core by definition. Whether single-core, multi-core or manycore, SoC processor cores typically use RISC instruction set architectures. RISC architectures are advantageous over CISC processors for systems-on-chip because they require less digital logic, and therefore less power and area on board, and in the embedded and mobile computing markets, area and power are often highly constrained. In particular, SoC processor cores often use the ARM architecture because it is a soft processor specified as an IP core and is more power efficient than x86. Systems-on-chip must have semiconductor memory blocks to perform their computation, as do microcontrollers and other embedded systems. Depending on the application, SoC memory may form a memory hierarchy and cache hierarchy. In the mobile computing market, this is common, but in many low-power embedded microcontrollers, this is not necessary. Memory technologies for SoCs include read-only memory (ROM), random-access memory (RAM), electrically erasable programmable ROM (EEPROM) and flash memory. As in other computer systems, RAM can be subdivided into relatively faster but more expensive static RAM (SRAM) and the slower but cheaper dynamic RAM (DRAM). When a SoC has a cache hierarchy, SRAM will usually be used to implement processor registers and cores' L1 caches whereas DRAM will be used for lower levels of the cache hierarchy including main memory. "Main memory" may be specific to a single processor (which can be multi-core) when the SoC has multiple processors, in which case it is distributed memory and must be sent via § Intermodule communication on-chip to be accessed by a different processor. For further discussion of multi-processing memory issues, see cache coherence and memory latency. SoCs include external interfaces, typically for communication protocols. These are often based upon industry standards such as USB, FireWire, Ethernet, USART, SPI, HDMI, I²C, etc. These interfaces will differ according to the intended application. Wireless networking protocols such as Wi-Fi, Bluetooth, 6LoWPAN and near-field communication may also be supported. When needed, SoCs include analog interfaces including analog-to-digital and digital-to-analog converters, often for signal processing. These may be able to interface with different types of sensors or actuators, including smart transducers. They may interface with application-specific modules or shields. [nb 5] Or they may be internal to the SoC, such as if an analog sensor is built in to the SoC and its readings must be converted to digital signals for mathematical processing. Digital signal processor (DSP) cores are often included on systems-on-chip. They perform signal processing operations in systems-on-chip for sensors, actuators, data collection, data analysis and multimedia processing. DSP cores typically feature very long instruction word (VLIW) and single instruction, multiple data (SIMD) instruction set architectures, and are therefore highly amenable to exploiting instruction-level parallelism through parallel processing and superscalar execution. :4 DSP cores most often feature application-specific instructions, and as such are typically application-specific instruction-set processors (ASIP). Such application-specific instructions correspond to dedicated hardware functional units that compute those instructions. Typical DSP instructions include multiply-accumulate, Fast Fourier transform, fused multiply-add, and convolutions. As with other computer systems, SoCs require timing sources to generate clock signals, control execution of SoC functions and provide time context to signal processing applications of the SoC, if needed. Popular time sources are crystal oscillators and phase-locked loops. System-on-chip peripherals including counter-timers, real-time timers and power-on reset generators. SoCs also include voltage regulators and power management circuits. Systems-on-chip comprise many execution units. These units must often send data and instructions back and forth. Because of this, all but the most trivial SoCs require communications subsystems. Originally, as with other microcomputer technologies, data bus architectures were used, but recently designs based on sparse intercommunication networks known as networks-on-chip (NoC) have risen to prominence and are forecast to overtake bus architectures for SoC design in the near future. Historically, a shared global computer bus typically connected the different components, also called "blocks" of the System-on-Chip. A very common bus for system-on-chip communications is ARM's royalty-free Advanced Microcontroller Bus Architecture (AMBA) standard. Direct memory access controllers route data directly between external interfaces and SoC memory, bypassing the CPU or control unit, thereby increasing the data throughput of the system-on-chip. This is similar to some device drivers of peripherals on component-based multi-chip module PC architectures. Networks-on-chip have advantages including destination- and application-specific routing, greater power efficiency and reduced possibility of bus contention. Network-on-chip architectures take inspiration from networking protocols like TCP and the Internet protocol suite for on-chip communication, although they typically have fewer network layers. Optimal network-on-chip network architectures are an ongoing area of much research interest. NoC architectures range from traditional distributed computing network topologies such as torus, hypercube, meshes and tree networks to genetic algorithm scheduling to randomized algorithms such as random walks with branching and randomized time to live (TTL). Many SoC researchers consider NoC architectures to be the future of system-on-chip design because they have been shown to efficiently meet power and throughput needs of SoC designs. Current NoC architectures are two-dimensional. 2D IC design has limited floorplanning choices as the number of cores in SoCs increase, so as three-dimensional integrated circuits (3DICs) emerge, SoC designers are looking towards building three-dimensional on-chip networks known as 3DNoCs. A system on chip consists of both the hardware, described in § Structure, and the software controlling the microcontroller, microprocessor or digital signal processor cores, peripherals and interfaces. 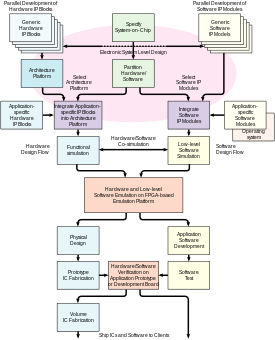 The design flow for an SoC aims to develop this hardware and software at the same time, also known as architectural co-design. The design flow must also take into account optimizations (§ Optimization goals) and constraints. Most SoCs are developed from pre-qualified hardware component IP core specifications for the hardware elements and execution units, collectively "blocks", described above, together with software device drivers that may control their operation. Of particular importance are the protocol stacks that drive industry-standard interfaces like USB. The hardware blocks are put together using computer-aided design tools, specifically electronic design automation tools; the software modules are integrated using a software integrated development environment. Systems-on-chip components are also often designed in high-level programming languages such as C++, MATLAB or SystemC and converted to RTL designs through high-level synthesis (HLS) tools such as C to HDL or flow to HDL. HLS products called "algorithmic synthesis" allow designers to use C++ to model and synthesize system, circuit, software and verification levels all in one high level language commonly known to computer engineers in a manner independent of time scales, which are typically specified in HDL. Other components can remain software and be compiled and embedded onto soft-core processors included in the SoC as modules in HDL as IP cores. Once the architecture of the SoC has been defined, any new hardware elements are written in an abstract hardware description language termed register transfer level (RTL) which defines the circuit behavior, or synthesized into RTL from a high level language through high-level synthesis. These elements are connected together in a hardware description language to create the full SoC design. The logic specified to connect these components and convert between possibly different interfaces provided by different vendors is called glue logic. Chips are verified for logical correctness before being sent to a semiconductor foundry. This process is called functional verification and it accounts for a significant portion of the time and energy expended in the chip design life cycle, often quoted as 70%. With the growing complexity of chips, hardware verification languages like SystemVerilog, SystemC, e, and OpenVera are being used. Bugs found in the verification stage are reported to the designer. Traditionally, engineers have employed simulation acceleration, emulation or prototyping on reprogrammable hardware to verify and debug hardware and software for SoC designs prior to the finalization of the design, known as tape-out. Field-programmable gate arrays (FPGAs) are favored for prototyping systems-on-chip because FPGA prototypes are reprogrammable, allow debugging and are more flexible than application-specific integrated circuits (ASICs). With high capacity and fast compilation time, simulation acceleration and emulation are powerful technologies that provide wide visibility into systems. Both technologies, however, operate slowly, on the order of MHz, which may be significantly slower – up to 100 times slower – than the SoC's operating frequency. Acceleration and emulation boxes are also very large and expensive at over US$1 million. FPGA prototypes, in contrast, use FPGAs directly to enable engineers to validate and test at, or close to, a system’s full operating frequency with real-world stimuli. Tools such as Certus are used to insert probes in the FPGA RTL that make signals available for observation. This is used to debug hardware, firmware and software interactions across multiple FPGAs with capabilities similar to a logic analyzer. In parallel, the hardware elements are grouped and passed through a process of logic synthesis, during which performance constraints, such as operational frequency and expected signal delays, are applied. This generates an output known as a netlist describing the design as a physical circuit and its interconnections. These netlists are combined with the glue logic connecting the components to produce the schematic description of the SoC as a circuit which can be printed onto a chip. This process is known as place and route and precedes tape-out in the event that the SoCs are produced as application-specific integrated circuits (ASIC). Systems-on-chip must optimize power use, area on die, communication, positioning for locality between modular units and other factors. Optimization is necessarily a design goal of systems-on-chip. If optimization was not necessary, the engineers would use a multi-chip module architecture without accounting for the area utilization, power consumption or performance of the system to the same extent. Common optimization targets for system-on-chip designs follow, with explanations of each. In general, optimizing any of these quantities may be a hard combinatorial optimization problem, and can indeed be NP-hard fairly easily. Therefore, sophisticated optimization algorithms are often required and it may be practical to use approximation algorithms or heuristics in some cases. Additionally, most SoC designs contain multiple variables to optimize simultaneously, so Pareto efficient solutions are sought after in SoC design. Oftentimes the goals of optimizing some of these quantities are directly at odds, further adding complexity to design optimization of systems-on-chip and introducing trade-offs in system design. For broader coverage of trade-offs and requirements analysis, see requirements engineering. SoCs are optimized to maximize power efficiency in performance per watt: maximize the performance of the SoC given a budget of power usage. Many applications such as edge computing, distributed processing and ambient intelligence require a certain level of computational performance, but power is limited in most SoC environments. The ARM architecture has greater performance per watt than x86 in embedded systems, so it is preferred over x86 for most SoC applications requiring an embedded processor. SoCs are optimized to maximize computational and communications throughput. SoCs are optimized to minimize latency for some or all of their functions. This can be accomplished by laying out elements with proper proximity and locality to each-other to minimize the interconnection delays and maximize the speed at which data is communicated between modules, functional units and memories. In general, optimizing to minimize latency is an NP-complete problem equivalent to the boolean satisfiability problem. For tasks running on processor cores, latency and throughput can be improved with task scheduling. Some tasks run in application-specific hardware units, however, and even task scheduling may not be sufficient to optimize all software-based tasks to meet timing and throughput constraints. Systems on chip are modeled with standard hardware verification and validation techniques, but additional techniques are used to model and optimize SoC design alternatives to make the system optimal with respect to multiple-criteria decision analysis on the above optimization targets. Task scheduling is an important activity in any computer system with multiple processes or threads sharing a single processor core. It is important to reduce § Latency and increase § Throughput for embedded software running on an SoC's § Processor cores. Not every important computing activity in a system-on-chip is performed in software running on on-chip processors, but scheduling can drastically improve performance of software-based tasks and other tasks involving shared resources. SoCs often schedule tasks according to network scheduling and randomized scheduling algorithms. For broader coverage of this topic, see Pipeline (computing). Hardware and software tasks are often pipelined in processor design. Pipelining is an important principle for speedup in computer architecture. They are frequently used in GPUs (graphics pipeline) and RISC processors (evolutions of the classic RISC pipeline), but are also applied to application-specific tasks such as digital signal processing and multimedia manipulations in the context of systems-on-chip. Systems-on-chip are often analyzed though probabilistic models, Queueing theory § Queueing networks and Markov chains. For instance, Little's law allows SoC states and NoC buffers to be modeled as arrival processes and analyzed through Poisson random variables and Poisson processes. SoCs are often modeled with Markov chains, both discrete time and continuous time variants. Markov chain modeling allows asymptotic analysis of the system-on-chip's steady state distribution of power, heat, latency and other factors to allow design decisions to be optimized for the common case. The netlists described above are used as the basis for the physical design (place and route) flow to convert the designers' intent into the design of the SoC. Throughout this conversion process, the design is analyzed with static timing modeling, simulation and other tools to ensure that it meets the specified operational parameters such as frequency, power consumption and dissipation, functional integrity (as described in the register transfer level code) and electrical integrity. When all known bugs have been rectified and these have been re-verified and all physical design checks are done, the physical design files describing each layer of the chip are sent to the foundry's mask shop where a full set of glass lithographic masks will be etched. These are sent to a wafer fabrication plant to create the SoC dice before packaging and testing. ASICs consume less power and are faster than FPGAs but cannot be reprogrammed and are expensive to manufacture. FPGA designs are more suitable for lower volume designs, but after enough units of production ASICs reduce the total cost of ownership. SoC designs consume less power and have a lower cost and higher reliability than the multi-chip systems that they replace. With fewer packages in the system, assembly costs are reduced as well. However, like most very-large-scale integration (VLSI) designs, the total cost[clarification needed] is higher for one large chip than for the same functionality distributed over several smaller chips, because of lower yields[clarification needed] and higher non-recurring engineering costs. When it is not feasible to construct an SoC for a particular application, an alternative is a system in package (SiP) comprising a number of chips in a single package. When produced in large volumes, SoC is more cost-effective than SiP because its packaging is simpler. Another reason SiP may be preferred is waste heat may be too high in a system-on-chip for a given purpose because functional components are too close together, and in an SiP heat will dissipate better from different functional modules since they are physically further apart. SoC research and development often compares many options. Benchmarks, such as COSMIC, are developed to help such evaluations. ^ This article uses the convention that SoC is pronounced /ˌɛsˌoʊˈsiː/ es-oh-SEE. Therefore, it uses the convention "an" for the indefinite article corresponding to SoC ("an SoC"). Other sources may pronounce it as /sɒk/ sock and therefore use "a SoC". ^ This central board is called the "mother board" for hosting the "child" component cards. ^ The graphics connections (PCI Express) and RAM historically constituted the northbridge of motherboard-backed discrete architectures. ^ The hard disk and USB connectivity historically comprised part of the southbridge of motherboard-backed discrete modular architectures. ^ In embedded systems, "shields" are analogous to expansion cards for PCs. They often fit over a microcontroller such as an Arduino or single-board computer such as the Raspberry Pi and function as peripherals for the device. ^ Pete Bennett, EE Times. "The why, where and what of low-power SoC design." December 2, 2004. Retrieved July 28, 2015. ^ Nolan, Stephen M. "Power Management for Internet of Things (IoT) System on a Chip (SoC) Development". Design And Reuse. Retrieved 2018-09-25. ^ Mittal, Sparsh. "A Survey on Optimized Implementation of Deep Learning Models on the NVIDIA Jetson Platform". Journal of Systems Architecture. ISSN 1383-7621. ^ "Is a single-chip SOC processor right for your embedded project?". Embedded. Retrieved 2018-10-13. ^ "Qualcomm launches SoCs for embedded vision | Imaging and Machine Vision Europe". www.imveurope.com. Retrieved 2018-10-13. ^ "Apple's A12 Bionic is the first 7-nanometer smartphone chip". Engadget. Retrieved 2018-10-13. ^ a b "ARM is going after Intel with new chip roadmap through 2020". Windows Central. Retrieved 2018-10-06. ^ a b "Always Connected PCs, Extended Battery Life 4G LTE Laptops | Windows". www.microsoft.com. Retrieved 2018-10-06. ^ "Gigabit Class LTE, 4G LTE and 5G Cellular Modems | Qualcomm". Qualcomm. Retrieved 2018-10-13. ^ a b c Furber, Stephen B. (2000). ARM system-on-chip architecture. Harlow, England: Addison-Wesley. ISBN 0201675196. OCLC 44267964. ^ a b c d e f g h Kundu, Santanu; Chattopadhyay, Santanu (2014). Network-on-chip: the Next Generation of System-on-Chip Integration (1st ed.). Boca Raton, FL: CRC Press. ISBN 9781466565272. OCLC 895661009. ^ "Best Practices for FPGA Prototyping of MATLAB and Simulink Algorithms". EEJournal. 2011-08-25. Retrieved 2018-10-08. ^ Bowyer, Bryan (2005-02-05). "The 'why' and 'what' of algorithmic synthesis". EE Times. Retrieved 2018-10-08. ^ EE Times. "Is verification really 70 percent?." June 14, 2004. Retrieved July 28, 2015. ^ "Difference between Verification and Validation". Software Testing Class. Retrieved 2018-04-30. In interviews most of the interviewers are asking questions on “What is Difference between Verification and Validation?” Lots of people use verification and validation interchangeably but both have different meanings. ^ Rittman, Danny (2006-01-05). "Nanometer prototyping" (PDF). Tayden Design. Retrieved 2018-10-07. ^ "FPGA Prototyping to Structured ASIC Production to Reduce Cost, Risk & TTM". Design And Reuse. Retrieved 2018-10-07. ^ Brian Bailey, EE Times. "Tektronix hopes to shake up ASIC prototyping." October 30, 2012. Retrieved July 28, 2015. ^ a b c d Ogrenci-Memik, Seda (2015). Heat Management in Integrated circuits: On-chip and system-level monitoring and cooling. London, United Kingdom: The Institution of Engineering and Technology. ISBN 9781849199353. OCLC 934678500. ^ "FPGA vs ASIC: Differences between them and which one to use? – Numato Lab Help Center". numato.com. Retrieved 2018-10-17. ^ EE Times. "The Great Debate: SOC vs. SIP." March 21, 2005. Retrieved July 28, 2015. ^ "COSMIC". www.ece.ust.hk. Retrieved 2018-10-08. Badawy, Wael; Jullien, Graham A., eds. (2003). System-on-Chip for Real-Time Applications. Kluwer international series in engineering and computer science, SECS 711. Boston: Kluwer Academic Publishers. ISBN 9781402072543. OCLC 50478525. 465 pages. Furber, Stephen B. (2000). ARM system-on-chip architecture. Boston: Addison-Wesley. ISBN 0-201-67519-6. Kundu, Santanu; Chattopadhyay, Santanu (2014). Network-on-chip: the Next Generation of System-on-Chip Integration (1st ed.). Boca Raton, FL: CRC Press. ISBN 9781466565272. OCLC 895661009. This page was last edited on 15 April 2019, at 17:23 (UTC).